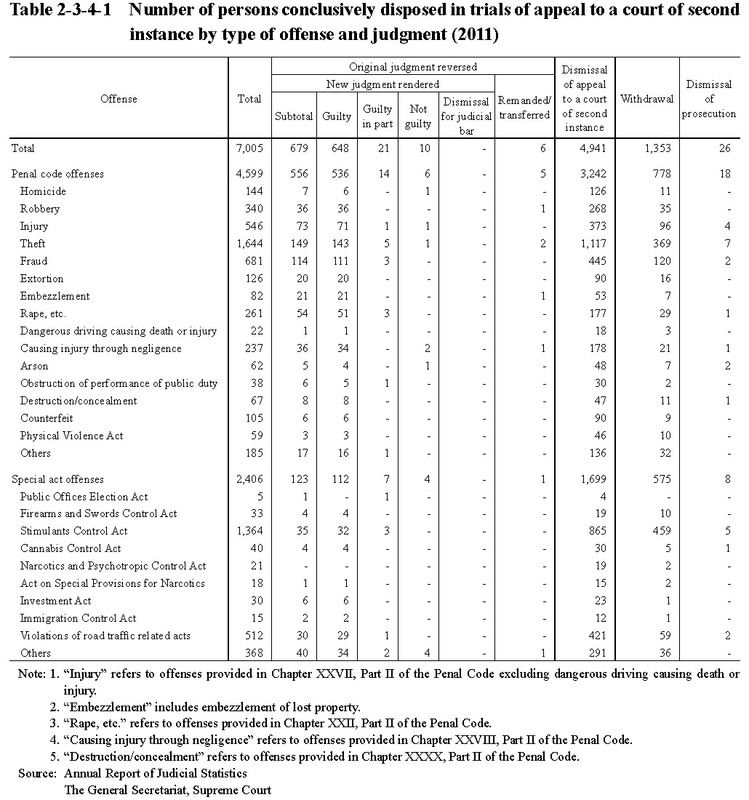 In 2011 the appeal rate (percentage of persons in cases filed appeals against judgments made in a court of first instance (appeals to a court of second instance or direct final appeals) among those conclusively disposed, but excluding those conclusively disposed due to dismissal of prosecution, withdrawal of a request for a formal trial, or transfer, etc.) was 11.0% in district courts and 5.0% in summary courts. Of persons conclusively disposed (including transfer, etc.) in trials of appeals in high courts as the second instance in 2011, 6,900 (98.5%) persons were in cases appealed only by the defendant, 82 (1.2%) only by the public prosecutor, and 20 (0.3%) by both, with three persons in cases reversed and remanded, etc. 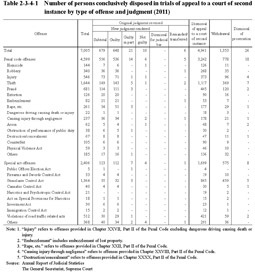 (Source: Annual Report of Judicial Statistics). Table 2-3-4-1 shows the number of persons conclusively disposed in trials of appeals in high courts as the second instance by type of offense and judgment in 2011. Dismissal of appeals to a court of second instance accounted for the largest in number at 4,941 persons (70.5%), followed by withdrawal of appeals at 1,353 (19.3%), and then those whose first instance judgments were reversed and new judgments rendered at 679 (9.7%). The most common reason with 685 persons whose original judgment was reversed in a high court was circumstances after the original judgment at 450, followed by the unreasonable sentence at 104, and then an error in the finding of facts at 80 (those with two or more reasons for the reversal are counted in each pertinent reason) (Source: Annual Report of Judicial Statistics). 10 persons had their original guilty judgments in the first instance reversed and were thereby found not guilty (Source: Annual Report of Judicial Statistics). Of 40 persons who had received not guilty judgments in the first instance against which public prosecutors then appealed to a court of second instance, 32 had their original judgments reversed and were thereby found guilty (Source: Annual Report of Statistics on Prosecution). The final appeal rate (percentage of persons in cases filed final appeals against judgments made in trials of appeals in a court of second instance among those conclusively disposed, but excluding those conclusively disposed due to dismissal or withdrawal of the appeal to a court of second instance, dismissal of prosecution, or transfer, etc.) in 2011 was 41.6%. Of 2,208 persons in final appeal cases conclusively disposed in the Supreme Court (including those whose cases were dealt with in a high court as the first instance) in 2011, 1,760 (79.7%) had the final appeal dismissed, 438 (19.8%) had the final appeal withdrawn, eight had their prosecution dismissed, two had the original judgments reversed and new judgments given, and no one had the final appeal reversed and remanded/transferred (Source: Annual Report of Judicial Statistics).